Our 5 newly refurbished (January 2017) bedrooms all have en-suite facilities (four rooms with shower and one with bath), ARRAN AROMATICS toiletries, goose down quilts, mattress toppers and pillows, Samsung digital televisions, tea & coffee making facilities and each is fitted and tastefully decorated to an individual design. Room rates (as undernoted) are based on 2 people sharing and include a choice of cooked breakfasts. Quiet and soothing, our rooms are set away from the hustle and bustle of the city, ensuring an extremely relaxing good night’s sleep. We have two lounge areas to catch up, do some reading or simply sit in front of the wood burning stove with a small libation. Hightae is a wonderfully quiet wee village with the morning rush-hour consisting of a couple of tractors and the occasional horse. We know how special short breaks can be with family & friends and we also know the responsibility of “simply” renting a large house for everyone – the organisation of all the food, drink, cooking and clearing up – can be an absolute right royal pain in the posterior. Let us deal with all that for you by having the whole place to yourselves for a few days and we’ll do all the behind the scenes stuff. You just arrive, relax and consume some great locally sourced food and wonderful drink. Think of it like a ski-chalet holiday without the need to hospitalize yourselves on the slopes. Give us a call to chat things through. ROOM RATES VARY ACCORDING TO THE TIME OF YEAR FROM £85 pn TO £110 B&B DURING PEAK SEASON. All of the above rooms are available on a reduced rate mid-week only single occupancy basis. Simply get in touch with us for rates. Please contact us directly if you have a specific room request. Check availability and click on the BOOK NOW button. 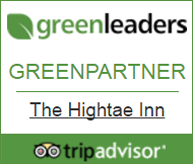 Email info@hightaeinn.co.uk with your reservation enquiry and we’ll respond as quickly as possible. Simply call us on 01387 811711 – we can offer you a great deal more information this way with added flexibility of specific room requests, multi-night discounts and any special offers that could be available. There may also be rooms availability directly with ourselves due to last minute cancellations which haven’t yet worked their way back onto our online booking site partners. B&B is available from March through to December (January & February are our Winter re-charge months). We’re closed during the day with our restaurant opening at 6pm. Check-in for guests is anytime between 5pm and 10pm. Breakfasts between 8am and 9.30am with check-out through to 11am. CHILDREN – We’re just a small Restaurant with Rooms and things have really been set-up for adults only, so you can relax in a child-free environment. PETS – Although we appreciate the importance of bringing your four legged associate on holiday, we are, unfortunately, unable to accommodate.